Modularity is the future. It's a line we've heard many times from Motorola Project Ara smartphone to gaming mice. However, modular device has never been fully realized with the exception of the LG G5, which has only introduced three optional modules. 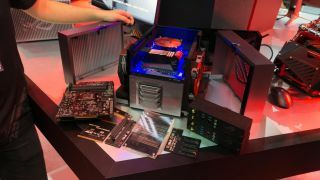 In the world of PCs, modularity makes the most sense since PC upgrades come fast and furious from new graphics cards to simply adding an SSD. That said we all remember Project Christine and how it went exactly nowhere, and so how can Asus' own Project Avalon modular PC concept possibly stand a chance? The simple answer is Asus' modular concept doesn't arrogantly rewrite the entire PC standard. Instead it's more of an adaptation that's designed to make upgrading easier. Sure the cubical aluminum Asus co-developed with case designer In-Win isn't not exactly an orthodox case even compared to most Mini ITX systems, however, beneath the shiny metal shell everything you know about PC hardware stays mostly intact. You still drop the CPU into a socket, slide the graphics card into a PCI-e lane and the hot swappable SSDs still plug into SATA III connectors. And when you dig even deeper, there's more to Project Avalon that lies below the surface. The system uses a unique motherboard that only features a processor socket, interchangeable I/O shields and space for memory DIMMs. You'll find everything else integrated into the five additional printed circuit boards hidden beneath the main motherboard including a PCI-e riser for the GPU. Unfortunately, Project Avalon isn't entirely without proprietary connectors. Avalon's project manager explained Avalon's success relies entirely on power supply manufacturers adding a logic board connector. Though it might seem like short Molex cables would have made a lot of sense here, the project manager explained the connectors aren't designed to handle these sorts of stresses, and ultimately the core idea behind Avalon is to take the hassle out of upgrading. Beyond developing a case of its own, Asus hopes other case makers will also participate and create their own version of Project Avalon and cement it as a new desktop standard. I for one hope it works out and can't wait to see how Asus will evolve its modular concept.